I have been going to the opera in Santa Fe for almost 30 years, and it always holds a special place in my affections. The new general director Charles MacKay, who is a Santa Fe native, appears to be hitting the ground running, and the festival seems to me in good shape even though I wasn't crazy about the operas I saw. 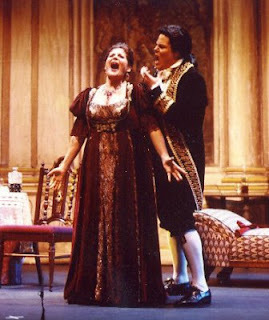 But here's a question that recurred during both "The Letter" and "Traviata": Why are audiences, artists, and production teams ready to jettison their usual sense of drama when it comes to opera? It doesn't take any special powers of perception to see that the 1940 film of "The Letter" is highly dramatic and the opera that premiered this weekend is not; why is it that we tend to be indulgent of opera not meeting the same standards as a stage play? And Bette Davis's performance, though in ways over the top, also displays a kind of restraint that is utterly foreign to Natalie Dessay, who as Violetta epitomized the kind of frantic non-acting that is today heralded (and not only from Dessay) as the pinnacle of the "new" operatic achievement. Why is it that in opera we are ready to accept this kind of thing as art? *There are many singers who rely solely on the mechanics of singing. They have been taught to sing from a book - in a sense, academically. One of the fundamental problems with solely relying on this type of voice training is the assumption that if these singers have learned to build the voice academically, they'll know how to use it. WRONG. To use a somewhat crude analogy: they've learned how to build a car, but don't know how to drive it. You can spot these singers from a mile away because they are the ones that blow a lot of noise, but live in a constant state of analysis: Is this muscle performing properly? Are the sounds balanced? Is the soft palate lifted? What about jaw placement? Is the larynx low? These are the singers that have completely blank looks on their faces because their focus is eternally inward. *Conversely, there are many singers who rely solely on - well - nothing. They haven't been taught much at all except "singing is like a crying baby - you breath and let the body do the rest." The fundamental problem with relying on the laissez-faire approach is that (again with the car analogy) these singers have learned how to push the gas pedal to the floor, but have no idea that it takes more to drive it that just pushing on the gas. You can spot these singers just as quickly as you can spot an academic singer. They're the ones who swear that they rely on the drama "to carry the voice" and end up pushing the voice beyond it's limits, getting themselves into trouble vocally, and then don't know how to fix it in the moment. What you end up with in that situation is a singer who has the "deer in the headlights" look on their face during the meatiest parts of the show. Training is absolutely imperative. But in the opinion of yours truly, there has to be a balanced approach in order to be able to later serve the art form in a proper manner. There has to be a cultivation of the balance between mechanics and drama. We should be proactive before reactive and should place analysis before results. Then, once it's all in our bodies we can truly walk out on stage and give of ourselves - our healthy, dramatic-selves - one hundred percent. Unfortunately, few singers cultivate this balance anymore... instead, we spend too much time worrying about our appearance and what size we are. Again, I say: balance. I encourage you to check out the inaugural posting on A Liberal's Libretto for more on the subject of size and appearance.